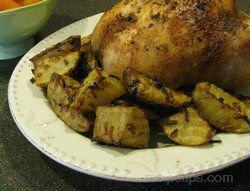 A quick and simple roasted potato that goes well with any meal. When you need an easy potato to finish of your dinner menu, this recipe is perfect. They have a light garlic flavor and are ready in less than 45 minutes. Preheat oven to 350 degrees F. Wash potatoes and cut into quarters. 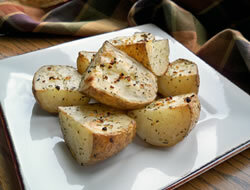 Combine olive oil, garlic, and Italian seasoning in a large bowl; add potatoes and toss to coat evenly. Pour into a glass baking dish. Sprinkle with salt and pepper to taste. Microwave for 5 to 10 minutes, just long enough for them to start to soften. 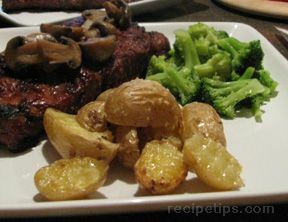 Place in the oven and bake for 20 to 30 minutes or until potatoes are tender when poked with a fork and have started to brown slightly. "These were really good roasted potatoes. Easy to make and would go with most any meal." 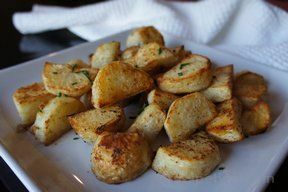 "I loved how simple these potatoes were and how great they tasted. It worked good to microwave for a little to cut down on the roasting time in the oven. We will be having these a lot because they will go great with many of our meals."